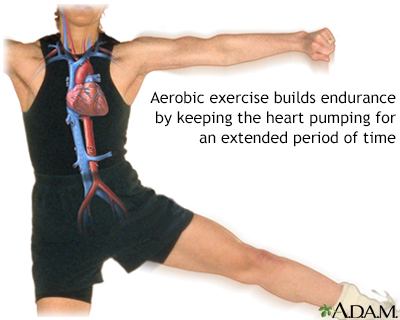 Which of the following is a benefit of regular exercise? The correct answer is all of the above. 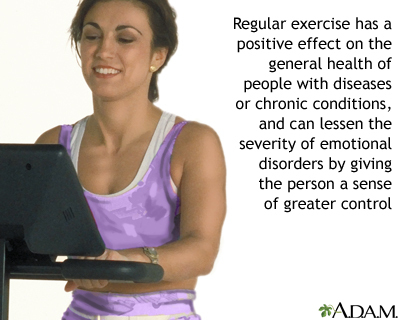 Getting regular exercise is one of the best things you can do for your body, mind, and spirit. Exercise helps your body work better. It can also make you look better, feel better, and even live longer. How much daily exercise do children need? The correct answer is 60 minutes. Even children who prefer staying inside and playing video games can learn to be active during the day. They can ride their bike to school, play active computer games, or help out with chores around the house. Kids are more likely to exercise if their parents are active too. The correct answer is fact. When you are active, your child will be too. Take walks before dinner, play hoops, or throw a baseball. Encourage your child to join a sports team. Some kids prefer team sports like soccer, and others prefer sports like swimming or tennis. Let your child choose. 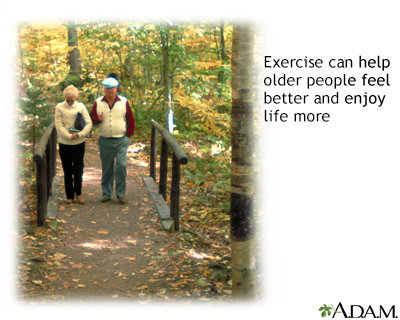 Regular exercise is good for your bones. The correct answer is fact. Doing exercises that put weight on your bones will help keep them strong and lower your risk of bone loss and breaks as you get older. Walking and strength training are good options. 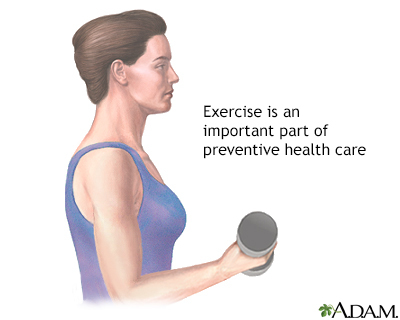 If you are older, haven't been active, or have a health problem, talk with your doctor before starting to exercise. The correct answer is making your immune system stronger. 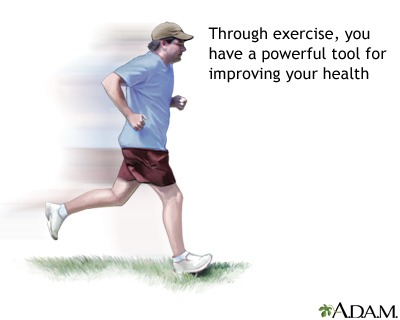 Exercise helps your immune system fight off infections from bacteria and viruses. It also lowers your risk of heart disease, osteoporosis, and cancer. Weight or strength training can build muscle and improve strength at any age. The correct answer is fact. Doing weight or strength training will build your muscles and make you stronger. Even older adults can gain strength from these exercises. 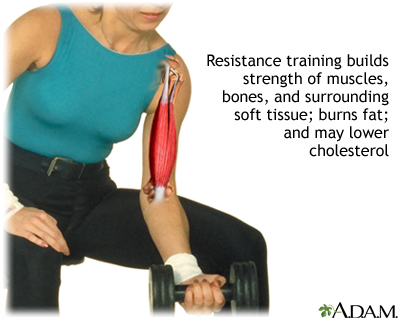 Use weights, resistance bands, or machines at a gym. Start slow, and work up to two 30-minute sessions every week. The correct answer is warming up and cooling down and stretching. Warm up your muscles and joints with gentle, full-body movements for 5 to 10 minutes before exercising. This can help prevent injury. 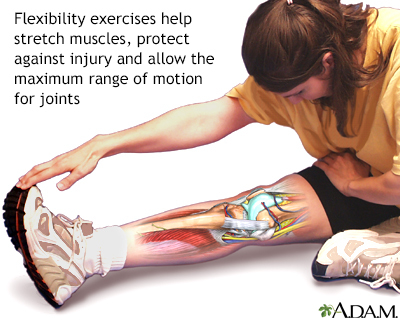 Cool down by walking slowly then stretching muscles to help prevent muscle strains after exercise. Some exercises can make you less likely to fall. The correct answer is fact. Exercises that improve balance make you stronger, more flexible, and increase how long you can be active. One simple example is to stand on one foot while waiting in line. Or sit down and stand up without using your hands. Tai Chi and yoga can also help you develop balance. Which of the following can help prevent sports injuries? The correct answer is all of the above. But if you do get hurt, stop playing. Never try to “work through” the pain because this can cause more damage. Minor aches and pains you can treat yourself at home. More serious injuries should be treated by a doctor right away. Some people just don’t have time to be physically active. The correct answer is fiction. Being more active takes effort, but it doesn’t have to take a lot of time. Break 30 minutes into three 10-minute sessions and work it into your schedule. 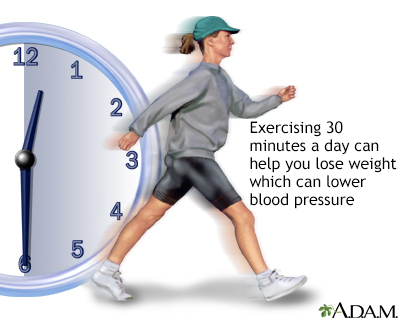 Plan to exercise during the time of day you like best, before work, at lunch, or in the evening. Or, build it into your commute. Find what works best for you. 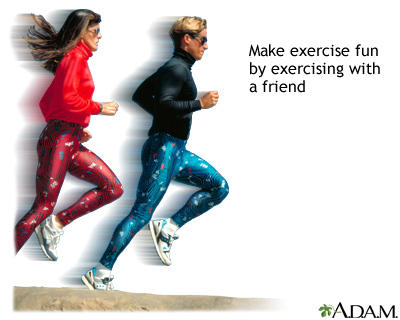 Exercising with a friend or a group of people can help make it more fun, interesting, and keep you motivated to continue with a regular exercise routine. Physical fitness is essential to good health and is one of the best things you can do for your body, mind, and spirit. Exercise improves the way your body works, and it can make you look better, feel better, and even live longer. To determine your maximum heart rate, subtract your age from 220. This number represents how many times your heart should beat per minute at its maximum rate. 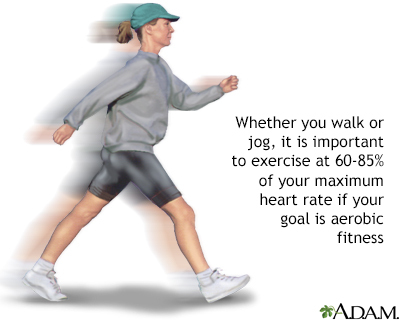 Multiply that number by 0.5 and 0.85 to determine your target heart rate range. If exercising at a moderate intensity, build up to exercising at 50% to 70% of your maximum heart rate for 2 hours and 30 minutes a week. If exercising at a vigorous intensity, build up to exercising at 70% to 85% of your maximum heart rate for 1 hour and 15 minutes a week.